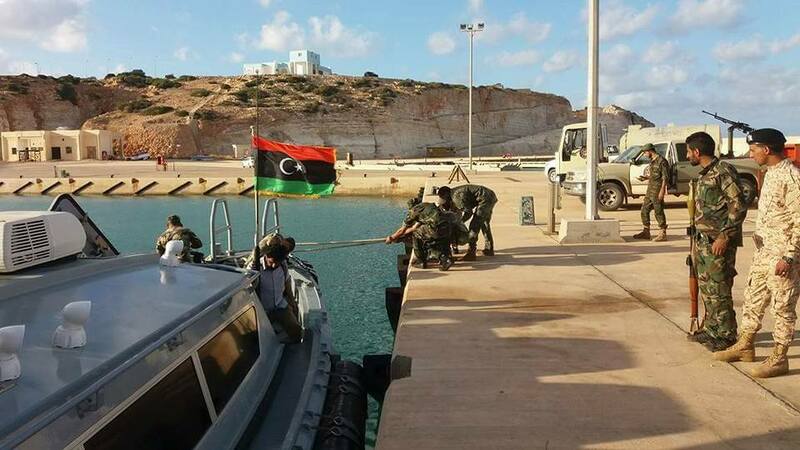 General Haftar instructed Tobruck’s armed forces, Marina and Air Force, To stop anyone approaching the territorial sea. Tobruk Government’s military exercises against ship from the coast. By May 2015 the LNA appears to have five MiG-21s supplied by Egypt. The aircraft seen in photographs show that at least some of these aircraft are MiG-21MFs – a type not previously been in service in Libya – and painted in a brown and yellow camouflage scheme close to one used on Egyptian MiG-21s than on Libyan ones. Recently released Google Earth satellite imagery showed five MiG-21s with this distinctive camouflage at Gamal Abdel Nasser Air Base 25 km south of Tobruk on 21 April. Meanwhile, the UAE supplied additional Mi-35 assault helicopters to the LNA in April 2015, according to the English language Libya Herald newspaper. Another vehicle produced in the UAE and/or Egypt and has been seen in LNA service is the Streit Typhoon 4×4 armoured personnel carriers. The Streit Group’s main production facility is in Ras al-Khaimah in the UAE. In April 2016 UAE donated a number of Armored Personnel Carriers (APC) and military pick-up trucks to the UN backed Libyan government in Torbuk. The number of vehicles sent by the Gulf emirate is unknown, but a picture posted by the Libyan National Army (LNA) shows dozens of new Panthera T-6 light APCs and Toyota Landcruiser pick-up trucks. The Libya Arab News Agency (LANA) reported in 2015 that the LNA had received 900 of the Panthera T-6 vehicles.